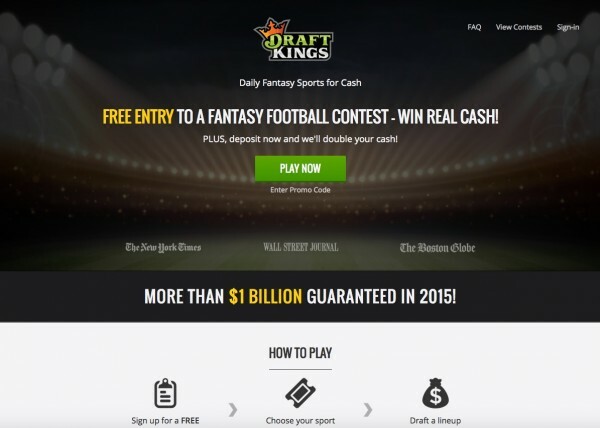 Daily Fantasy Sports is everywhere. 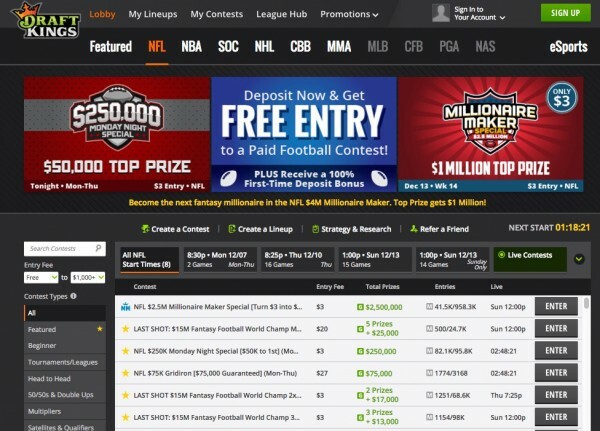 Seemingly everyone in America has been exposed to advertisements touting this digital phenomenon, most likely in the form of an ad for DraftKings or FanDuel, the two most popular daily fantasy sports (DFS) sites. If you watch football, hardly a touchdown, kickoff or timeout goes by without another DFS ad. Both sites are extremely popular, each boasting more than a million users.1 Their ads make the same exact claims: fantasy sports with no long-term commitment and the chance to win lots of money. With two digital companies offering essentially the same product, a good user experience can separate the winner from the loser in this multi-million dollar industry. So which site scores a touchdown and which one gets stopped at the goal line? To find out, I teamed up with Ben McNeil, Associate Director of Experience Design and Strategy at Isobar. We’re both fantasy football enthusiasts, and DFS novices. We ran a competitive review to compare the two sites. This type of usability test involves a team of experience designers evaluating two or more competing sites and identifying their strengths and weaknesses across a number of categories.2 We broke the experiences up into distinct interactions, and used different devices along the way. Choosing a winner is optional in a competitive report, but we’re talking about fantasy sports here, so we set out to declare a champion, or as we call it, the King of the Duel. We kick off our test using laptops and call up fanduel.com and draftkings.com. On initial load, the home pages look as similar as the offerings. They both feature large hero images and clear calls to action. Even their color schemes and imagery are similar. 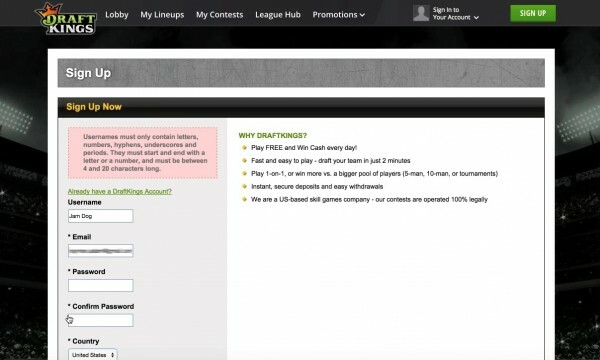 However, there’s one feature on the DraftKings site that makes it stand out: it affords users access to the rest of the site without logging in. Users can view various contests, read FAQs, and even draft a team without providing a single bit of personal information. FanDuel requires users to create an account before they can view anything other than the home page. 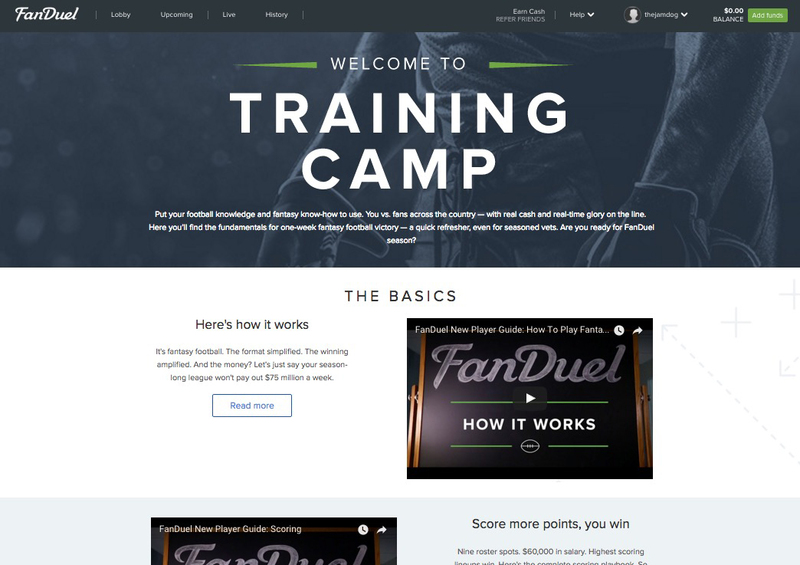 While the two sites’ home pages are remarkably similar, DraftKings provides entry points to deeper content without signing in. We use the main calls to action to sign up for each site. To create a quality account creation process, good form design is crucial. FanDuel’s experience is practically effortless. We fill out four simple form fields without trouble, and it’s just as easy to deposit money into our account. 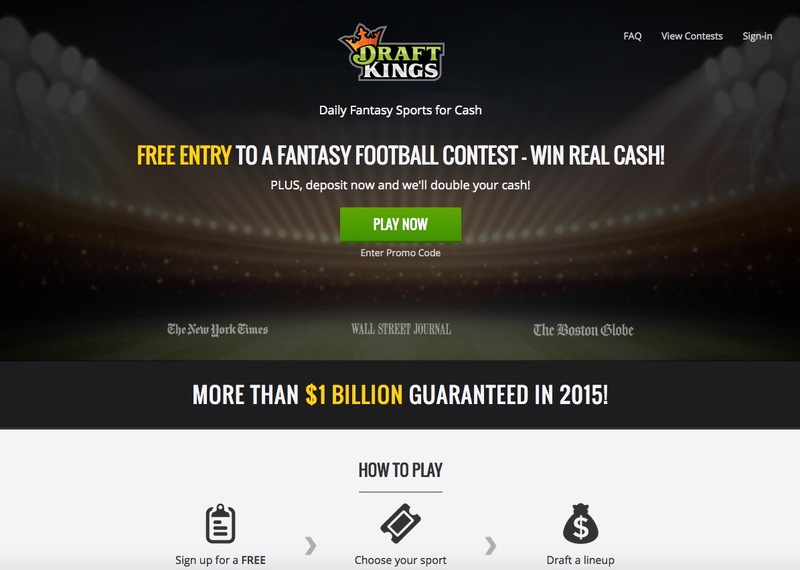 In contrast, DraftKings’ form is cumbersome. It requires much more information, and the visual design is unappealing. There’s no in-form validation, so we get no guidance while creating a username, and every errant entry delivers a verbose error message and wipes out most of our inputs. We fill out the form four times before we get it right, and in the process, we get so frustrated we want to give up on the site entirely. The whole experience draws a flag. Once we set up our accounts, we seek out documentation that will shed some light on how DFS works. Neither site orients its users particularly well. FanDuel’s navigation is confusing, and features unfamiliar terms. Eventually we stumble upon the documentation we’re looking for, but its entry point is nowhere near where we’d expect. Once we find it, we see that the help content is clear and engaging. It features a mixture of text and video and provides additional tips for assembling a winning roster. DraftKings does even worse in this category, as the material is apparently nowhere to be found. The site features four levels of horizontal navigation, and clicking around them gets us lost quickly. We somehow wind up on DraftKings’ video game page before giving up. Throughout the rest of the week, FanDuel gains yardage in this area, as it emails us links to the beginner’s guide and various orientation videos. FanDuel offers fantastic help documentation…once we find it. Deciding on a contest format is a complicated endeavor. There are hundreds of options featuring various rules, specifications and entry fees. FanDuel recognizes we’re beginners and recommends a few “rookie leagues.” We skip past this screen and go to the “lobby,” the page that lists the various contests. It’s overwhelming, but brief descriptions within the tabs containing the major contest types provides some order to the chaos. We retreat to the previous screen and take FanDuel up on its recommendations, joining a $10 rookie 50/50 league. DraftKings’ experience in this area is even more disorienting, with loud, blinking, annoying ads interspersed between the various rows of navigation. The color scheme is dark and intimidating. There are many filters to narrow down the options, but they feature terms we’re not yet familiar with. We use their search function and choose a $10 beginner 50/50 tournament, though we feel we’ve taken a hit during the experience. Flashing ads and a cluttered interface make the DraftKings lobby feel like a casino. Now the fun begins. We get to start drafting our teams. Both sites have similar layouts, with player options on the left and our in-progress roster on the right. We see clear indicators of player salaries and our remaining budget, as well as links to the latest player news and stats. 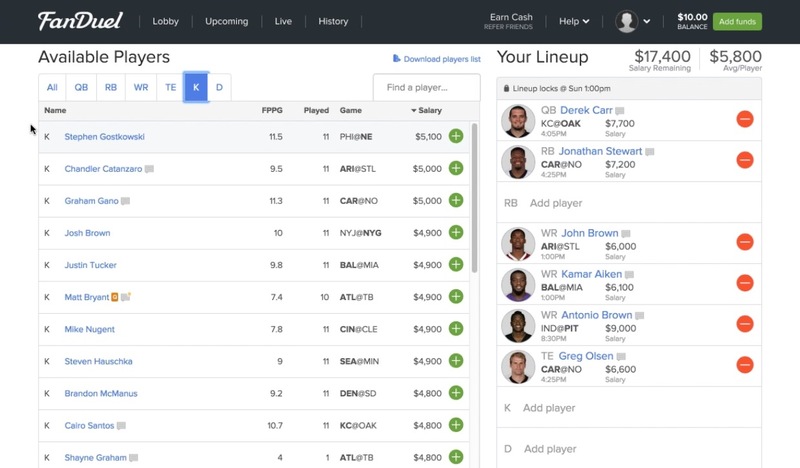 FanDuel’s interface is cleaner and less cluttered, and its visual design is inviting. However, it’s missing a layer of analysis we both rely on, such as information on a player’s opponent. As we complete our first pass at our FanDuel roster, we feel energized and excited to play more. DraftKings’ interface is darker and more serious. However, it clearly presents the extra stats we’re looking for, such as how the opposing team ranks vs. each player’s position. It also offers depth charts and even weather reports, great tools for making roster decisions. As we poke around, we realize that DraftKings doesn’t make us draft a kicker, offering a flex position instead. This ingratiates us to no end as fantasy football enthusiasts. We don’t get the same warm, fuzzy feeling from the DraftKings interface we got from FanDuel, but with the advanced stats in our playbook, we feel more informed, and better about our team’s chance of winning. FanDuel’s clean design leads to a feeling of energy and excitement as we create our team. With the initial setup complete, I cut Ben loose and move on to roster refinement. I download each site’s iOS app and set out to create winning lineups by swapping players in and out until I’m completely satisfied. The process of swapping out a player varies slightly between apps, but they each require exactly the same number of taps to make the substitution. While pondering lineup decisions, I pick up on an important trend. 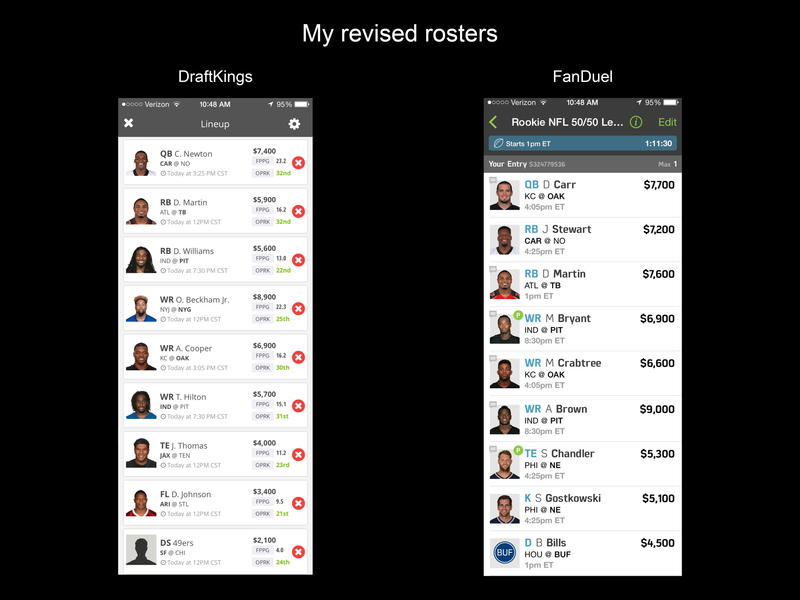 FanDuel’s design is cleaner, while DraftKings provides more player data. I’m trying to create winning teams, so access to advanced stats goes a long way. Additionally, DraftKings’ stats are color-coded with a familiar red and green, allowing me to easily identify which players have good match ups. By Sunday morning, my DraftKings lineup is full of players with good match ups, and DraftKings’ field position improves significantly. 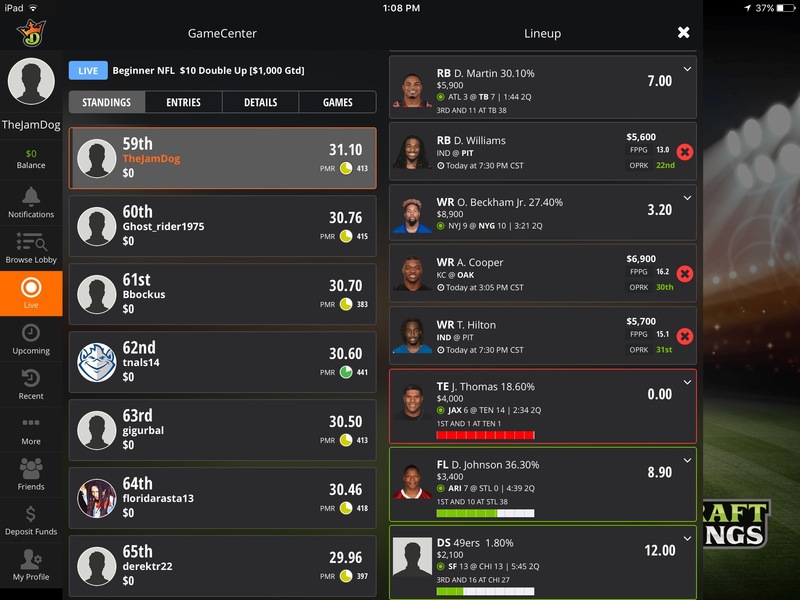 While FanDuel’s interface is cleaner, DraftKings presents a more complete collection of useful stats. Sunday arrives and I’m pumped to see how my teams do. I set up my iPad and download each site’s app so I can follow along as the games unfold. Initially I am underwhelmed by both apps. They both make navigating to my in-progress games more difficult than it should be. When I finally locate my FanDuel contest, I’m greeted by a long list of contestants, but I don’t see my entry, and can’t get to it without a ton of scrolling. There’s a link to view just my team, but it takes some finagling before I’m able to view my team and the rest of the field in the same view. Eventually I notice a small chart that shows my spot on comparison to the other players and tells me where I need to be to win money. It’s helpful, but it takes some work to understand it initially. On DraftKings, it’s easier to see both my team and the rest of the competition. As I scroll through the list of contestants, a button appears that allows me to get to where my team is within the list, which makes scanning the field much easier. There’s also a lot more information presented on each of my players, including a chart that shows where each player’s team is on the turf. Color-coded pie charts next to each contestant show how many player minutes are left for each team, which is immensely helpful. DraftKings’ tendency to present more data than FanDuel continues, and it’s even more pronounced on the iPad as I track the live results. DraftKings’ comprehensive stats and progress indicators move the platform ahead of FanDuel for good. The day ends as the Steelers take a knee to complete their Sunday night blowout vs the Colts, and I check out how my teams fared. My FanDuel team did well, finishing 33rd out of 100 and turning my $10 investment into an $18 payout. My DraftKings team came up just short, finishing 56th out of 113 and missing out on a cash prize by less than four points. While my DraftKings roster lost, the DraftKings platform is a winner. FanDuel fared well in the beginning, as it presented the superior authentication, orientation and learning experience. Those trying DFS for the first time may want to give FanDuel a tryout. However, if I return to DFS, it’ll be via DraftKings. Information density is key here. As experience designers, we strive to present the right amount of information to our audience without going overboard. DraftKings is better at striking this balance. It’s stat-heavy, which goes a long way in the fantasy football world. And for that reason, I declare DraftKings to be the King of the Duel. Adam Rayman is a Senior Experience Designer at Isobar. He is gearing up for the playoffs in Isobar’s fantasy football league, and hopes to bring home the crown this year.